INVOLVE was established in 1996 and is part of, and funded by, the National Institute for Health Research, to support active public involvement in NHS, public health and social care research. It is one of the few government funded programmes of its kind in the world. As a national advisory group our role is to bring together expertise, insight and experience in the field of public involvement in research, with the aim of advancing it as an essential part of the process by which research is identified, prioritised, designed, conducted and disseminated. The INVOLVE Advisory Group has 15 members. Our members encompass a broad mix of individuals who use health and social care services, carers, people from voluntary organisations, and health service and social care practitioners, managers and researchers. A world of active public research partnerships leading to improvement of health and care for all. 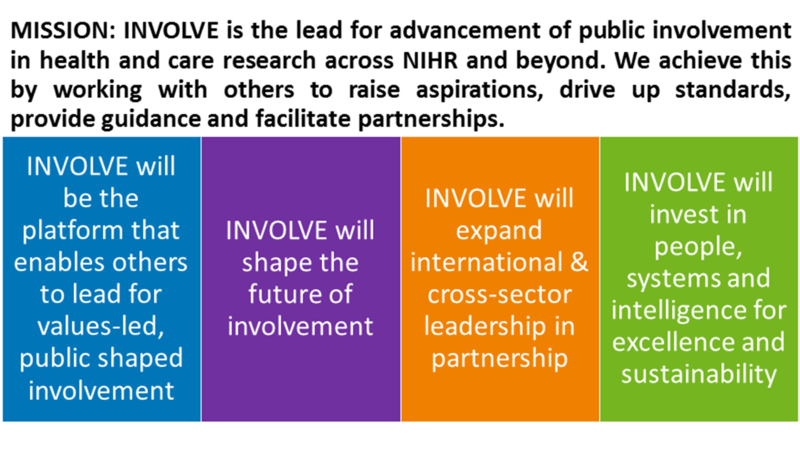 INVOLVE is the lead for advancement of public involvement in health and care research across NIHR and beyond. We achieve this by working with others to raise aspirations, drive up standards, provide guidance and facilitate partnerships. Find out more about the work of INVOLVE and our quarterly meetings by reading our minutes, strategic and operational plans. Details of current vacancies at the INVOLVE Coordinating Centre.